How do I stop my puppy from gulping her food? (Q) How do I stop my puppy from gulping her food? I feed her the correct daily amount but every meal time she seems to gulp it so quickly. 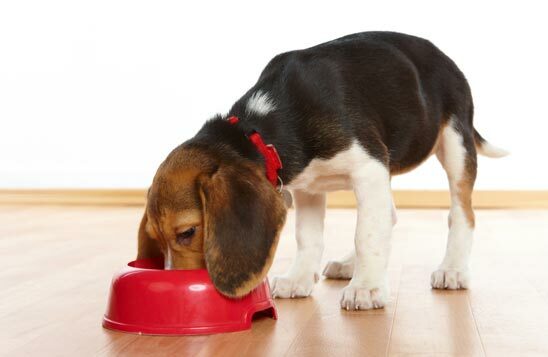 (A) Behaviourist Steve Goward says: Many puppies will eat their food really quickly, especially if they previously had to push other pups away due to being fed from a single large bowl. Depending on the age of the pup you can increase the feeds so she gets the same amount but split into more meals in an attempt to convince her that food is not in short supply, but actually comes very regularly. Alternatively, you could spread the food out; put small piles in the area in which she is normally fed, or in the garden, to provide enrichment and fulfil her natural ability to find food. Food activity toys are very useful but caution is needed to ensure you don’t make it too hard for the puppy and inadvertently cause a build-up of frustration, which in some circumstances can lead to aggression over food. Chewing is a big part of many dogs’ lives and by giving chewing material in conjunction with their food it is possible to create a calmer response to mealtimes. Should I get one or two dogs? Last PostHow frequently should dogs be vaccinated?Next PostWhy do dogs get hot spots?